Firstly we need to download the PHP zend framework. Once it has finished downloading unzip the package and copy the directory “library > Zend” to a directory on a PHP enabled server. For this example we have a folder called amf on a development server where we are storing all of the files. This is a simple class file used to store a persons name. This class might relate to a row of data in a database. Later on we will create the same class in Flex Builder and establish a link between the two so that we can share instances of this object between Flex and PHP. The Services class contains only one function, which creates two instances of the DataModel class. For a production project we might use this class to connect to a database and parse rows of data into DataModel objects. This class will also be available to us in Flex, however we will use only one instance and assign it to an MXML Remote Object. Tells the AMF service to create a link between our PHP DataModel class and our Flex DataModel class (we will create this later), so that we can share instances of the class betwwen the two technologies. In order to test our implementation so far we can navigate to this endpoint file. In this example the files are located in a directory called amf running on a development server. The url is: http://localhost/amf/. After navigating to the url a short message appears that says ‘Zend Amf Endpoint’. This means everything is working properly. 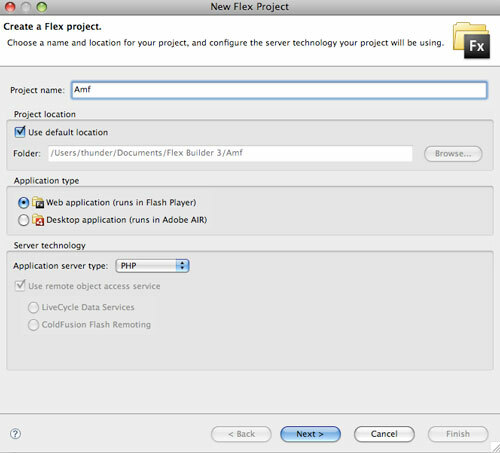 Next we need to create a Flex Builder project and communicate with our Zed AMF server. Firstly when we create our project we need to ensure that we choose PHP as our Server technology. We can create an AIR or Web based application. This example uses a web application and is called simply Amf. 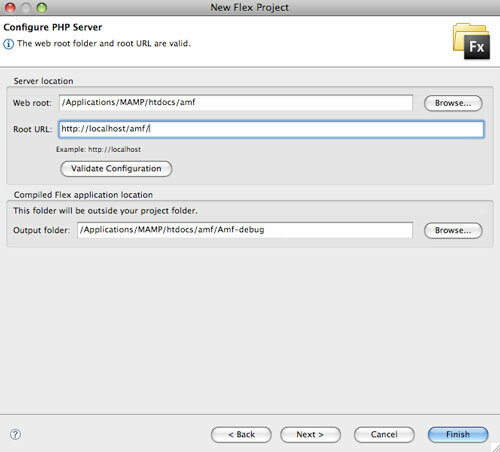 Next we need to specify the location of our php files locally and remotely. 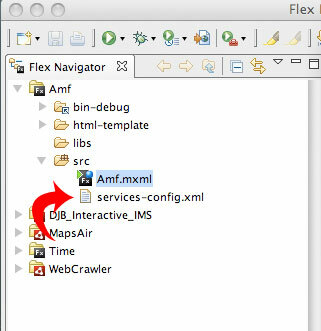 With our Flex project created the next step is to create an XML file which will be used to configure our Zend AMF server. 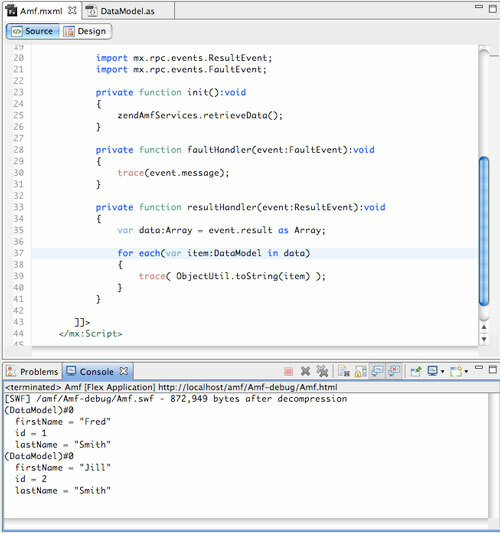 In this example the file is called ‘services-config.xml’ and located in the projects ‘src’ folder. The ‘endpoint’ attribute needs to be changed to the url of the Zend AMF server. Before we can move on to setting up our MXML file we need to add a setting to our compiler which will tell the project to use our ‘services-config.xml’ file. 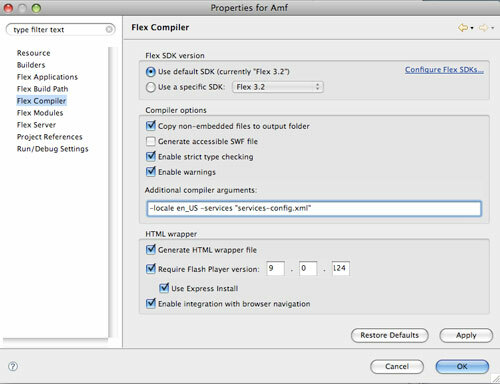 Add -services “services-config.xml” as an additional argument. Here we can see that the properties of our two DataModel objects have been output to the console in Flex. This means that we have successfully communicated with our PHP classes and transfered two PHP Objects from our server to our client side Flex application, preserving both the Class structure and instnace variable data.